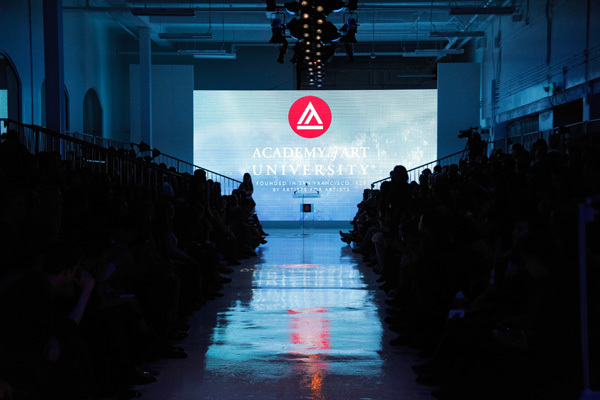 On Thursday, May 3rd the Academy of Art University hosted it’s annual Graduation Fashion Show and Awards Ceremony, an unforgettable evening of sartorial splendor. Press, industry, students, family, and friends – not to mention our awesome Guests of Honor – all packed into our new venue at The Cannery for a seriously impressive show. Academy of Art University President, Dr. Elisa Stephens, opened the show, welcoming all of the fashionable attendees and presenting Honorary Doctorates to Sarah Burton, creative director of Alexander McQueen, Philip Treacy, milliner, and Her Royal Highness Princess Reema Bandar Al-Saud, president and CEO of the ALFA and AL HAMA luxury retail corporations who own and operate Harvey Nichols, Donna Karan, and DKNY stores in Saudi Arabia. The flashbulbs (alright cellphones – but flashbulbs sounds so much cooler) were going wild as our guests took to the stage to receive their honorary degrees. Other front row players included Suzy Menkes, fashion editor of the International Herald Tribune, Cathy Horyn, fashion critic for The New York Times, Stephan Rabimov, editor in chief of DEPESHA magazine, Jayne Seward, fashion editor of California Apparel News, and Katie Hintz-Zambrano, senior editor at Refinery29 – suffice it to say that there were some serious industry heavyweights in the room. But onto the main attraction – the Graduation Fashion Show and Awards Ceremony. The show opened with Renata Lindroos and Mina Fadaie’s collection – a fashion and textile design collaboration inspired by distorted perceptions in 1960s horror films. The architectural pieces looked amazing on the runway, and the prints had everyone mesmerized. Hely Nguyen’s collection followed – a series of structured menswear-inspired looks that play with length and layers. Then it was onto a the collaboration featuring designs by Erica Laba, textiles by Liza Quiñones, and knitwear by Emma Mengchen Yang. The opening look was a sheer, silk organza shirtdress that achieved the perfect balance between prim and provocative. Ethan Chihuan Yang’s minimalist collection featured angular, sculpted silhouettes in dark hues that were simultaneously restrained and dramatic. The first menswear collection of the show was designed by Rumi Iwasaki, who was inspired by vintage police uniforms but rendered them ultra modern with sharp lines and a dove gray palette – each piece was tailored to perfection. The following collaboration by Rachael Sansom and Chelsea Levinson added a psychedelic flair to the show. The combination of Rachael’s prints and Chelsea’s neon knitwear created a clash and clamor on the runway in the most amazing way. Kim Tran’s collection followed suit, featuring patterns and prints layered one over another, embellished with fringe and structural jewelry by sculpture student Orly Ruaimi. The voluminous silhouettes and gorgeous draping in Ki Chung’s collection were the result of an eco-conscious design approach, using minimal seams and minimal waste cutting. The textiles gave it a tribal feel, but was kept modern by the subdued color scheme. Mimi Iwasaki’s oversized silhouettes seemed to glide down the runway effortlessly, in a flurry of fabric and pleats – a relaxed take on traditional Japanese clothing. 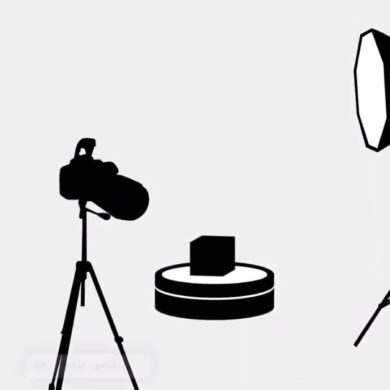 Maria A. Romero’s collection was presented, not on the runway, but through a short film. 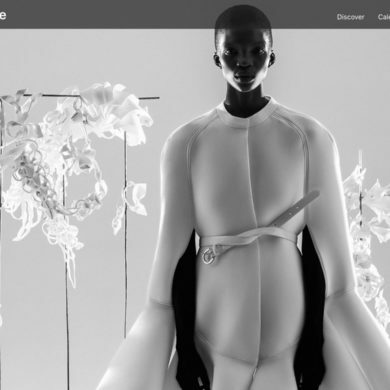 She constructed voluminous confections on a set of dolls, and collaborated with students from the School of Animation to bring the collection to life. The film was strikingly beautiful, telling a story through the clothes. 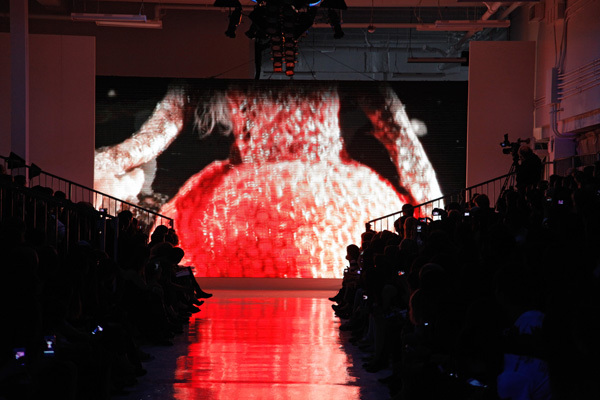 A still from Maria’s film as it lights up the runway. Photo by Randy Brooke. The following collection by Steven La Fuente was refreshingly feminine without feeling girly. The sharp lines and angles added just the right amount of structure and edge, and the accompanying jewelry by Lenny Kovner was the perfect finishing touch. Antonio Luna’s menswear collection followed – a stunning array of sharply tailored looks in wool and leather. The collaboration by Eli Daniel Odisho and Miriam Tolentino looked amazing on the runway, allowing the audience to really see the structure of each piece from all angles. Jacqueline Rabôt and Julie Seltzer’s collection added a welcome jolt of color to the show. The delicate fabrics were a perfect complement to the intricate beading and patterns. Zhangchi Wang’s collection, inspired by ancient Chinese stone carvings, was exquisite. The architectural garments were embellished with hand-stitched patterns mimicking traditional fabrics such as houndstooth and cable – the strict attention to detail was apparent. And Angela Sison’s feminine take on the 1950s youth cult, The Teddy Boys, was a collection of monochromatic, sherbet-hued looks. The long mint green coat and pant ensemble was particularly intoxicating. Closing the show was Massa Ito’s collection – structural, dramatic pieces inspired by traditional Japanese menswear. The vintage kimono fabrics offered a perfect juxtaposition to the modern silhouettes. At the close of the show, a number of awards, scholarships, and internships were announced – look out for our post with the full list! As soon as the lights turned on, the talk turned back to the runway, everyone was amazed at the level of the student work. Excited students were greeted by family and friends, congratulating them on a remarkable show. It really was an impressive evening – we are so proud of all of the students! View our favorite looks from the collections below – and watch out for the full line-up to be posted in the Portfolio & Runway section of the blog! Previous Design an Amazing Headpiece for TEED!